35.5 Acre Pleasant Springs Orchard - A family run business with over 74 varieties of tree-picked apples sold at Dane County Farmers Markets for 40 years! The gorgous orchard produces a wide variety of fresh fruits and vegetables, cider, apple butter, apple sauce & honey. 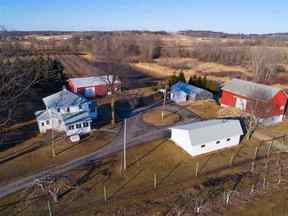 Everything about this farm has been lovingly cared for in a lush setting just miles off Interstate 90. Sale is "Turn Key" with all the equipment included, 7 buildings, irrigation system, tractors, retail store, deer fencing & more. Seller will work with new owners to ensure a smooth transition for the Orchard's successful operation.